I try to imagine the government coming to my house one morning and taking my five year old daughter and eight year old son away to a boarding school hundreds of kilometres away. I try to imagine that at this school, my children’s hair will be cut, their dastars and kakkars will be removed and they will be forcibly baptized as Christians. I try to imagine that they will be beaten for speaking Panjabi, reading Bani or trying to maintain their religious and cultural traditions. I try to imagine that even their basic health needs will not be looked after and they may well die from treatable infections and diseases. And then, I must admit, I am not able to imagine the rest; I cannot bear to imagine them being abused, assaulted, beaten and raped. As a nation, Sikhs are extremely proud of our own anti-colonial struggle against the British. Yet we have completely failed to acknowledge that in Canada we have succeeded due to the colonial oppression of other nations. This land where we build our homes and businesses was the land of nations that lived here for tens of thousands of years. Yes, one hundred and seventy years ago the British annexed Panjab and ended Khalsa Raj. But the British did not exile us from our own villages and towns. The British did not take our land and build new cities. The British did not migrate to Panjab and force us to live on inadequate reserves. We face discrimination in Canada and suffer from chronic underfunding in order to address challenging issues like domestic violence, sexual abuse and drug use. However, we are not without means. We have Sikh representatives at every level of government across the country and have been financially successful as a community. We owe a debt to this country and to its true heritage; not the Canada evolved from French and British colonies but to a land that was the sovereign territory of nations that sustainably farmed, fished and hunted here since before the dawn of history. It has become an integral part of how we define ourselves, this message that “Sikhs believe in equality” but speaking those words is easy; living this in truth is much more difficult. We need to demonstrate our commitment to the revolutionary message of Guru Nanak Sahib, that every human being contains equally an aspect of the divine and that we are all truly worthy of having our basic human needs and rights protected and defended. In fact, this impulse to speak against the oppressor in defense of the rights of the other stems from the Gurus themselves. It was Guru Nanak Sahib himself who faced down the first Mughal Emperor Babur after his invading forces had committed horrendous massacres. Though Guru Nanak Sahib stood alone, he did not hesitate to speak against those who had perpetrated the crimes he witnessed. One of the most treasured episodes in Sikh history is the Shaheedi of Guru Tegh Bahadur Sahib. In November of 1675, Guru jee gave his life in the streets of Delhi. He did not die for Sikh rights but instead he gave his head as an act of political disobedience against the Mughal Empire’s forced conversion of Hindus. That a leader of a religion would die to to defend the rights of another religion is almost unbelievable and Guru Tegh Bahadur’s example still stands uniquely in all of human history. It is our Ninth Guru’s example that Sikhs strive to emulate when we defend the rights of those who are different from us. ਹਉ ਢਾਢੀ ਕਾ ਨੀਚ ਜਾਤਿ ਹੋਰਿ ਉਤਮ ਜਾਤਿ ਸਦਾਇਦੇ ॥ Ha▫o dẖādẖī kā nīcẖ jāṯ hor uṯam jāṯ saḏā▫iḏe. (SGGS 468). That is the challenge put forth to us by the Guru, that we must place ourselves in the position of those who have no power in our societies, those who have been cast off and dehumanized. Idle No More is a response not only to the legacy of colonialism but the continuing colonialism that First Nations people are being subjected to. First Nations simply want the their rights as a sovereign people respected. They want justice for the crimes of the past and the basic human dignity that all people are entitled to. They want control of their resources and the right to educate and govern themselves as they see fit. Does this sound familiar? It’s exactly what Sikhs have been struggling for in India for the last several decades. 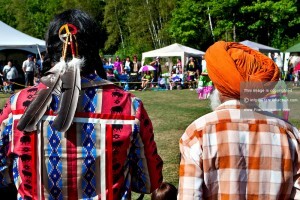 From the Anandpur Sahib Resolution to the demand for justice for victims of massacres, human rights abuses and pogroms to Panjab’s ongoing struggle with government enabled substance and alcohol abuse, the parallels between Idle No More and contemporary Sikh struggles is striking. But these protesters are not just fighting for themselves, they are fighting for all of our rights. They are fighting against the government’s omnibus bill and its erosion of environmental protection. They are fighting for all of our futures. Today we face many problems as a community. We face internal divisions and external threats. But that has always been the case throughout Sikh history. Things have never been easy for our people. But we are capable of greatness when we are united. And when do we unite? When we struggle for justice, freedom and equality. Idle No More is a growing movement. It is the voice of a people demanding their rights. We need not care about political expediency. Sikh history is clear: the Sikh response to marginalized people fighting for rights has always been simple. We stand with you. Against all odds, we stand for you. This entry was posted in Canadian Constitution and tagged aboriginal law, Aboriginal rights, Canadian Constitution, Canadian Indian Act, engagement, environment, environmental assessment, First Nation Rights, first nations, government consultation, government policy, Idle No More, Indigenous, major projects, natural resource development, natural resources, Regulatory process, title by Michelle Goodkey. Bookmark the permalink. Do you mind if I quote a couple of your articles as long as I provide credit and sources back to your website? My blog site is in the exact same niche as yours and my users would really benefit from a lot of the information you present here. Please let me know if this okay with you. Thanks! Please feel free to quote what you need. And thank you for asking prior to quoting.